Experts at a programme on Friday stressed the need for inclusion of Mathematics in the MBBS curriculum. Flourishing science and technology-based education can plays key role in economic development of the country and Mathematics is closely related to science and technology, they observed. They came up with the remarks while speaking at the closing and prize-giving ceremony of ‘AF Mujibur Rahman Foundation 8th National Undergraduate Mathematics Olympiad-2016’, organized by Bangladesh Mathematical Society, at Bangladesh University of Engineering and Technology in the capital. 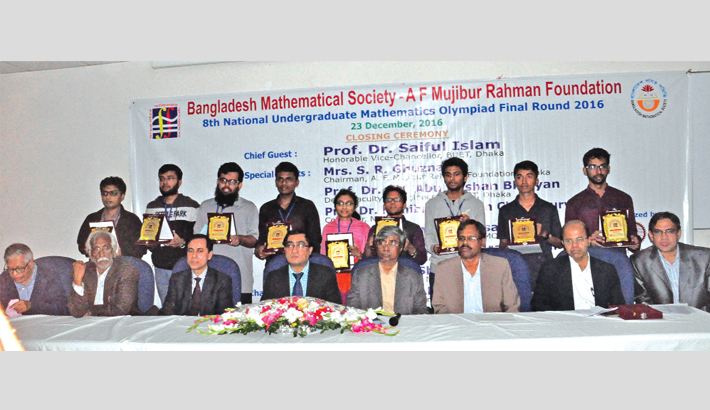 The Mathematics Olympiad was arranged with the financial support of AF Mujibur Rahman Foundation. A total of 10 students were announced winner of the final round of Mathematics Olympiad. Nabil Ibtehaz of BUET secured 1st position, Moonzarin Reza of BUET 2nd position and Aslam Hossain of Barisal University became third while other winners are Tonmoy Boiragi of Khulna University, Najim Mohammad Nafis of Dhaka University (DU), Sadat Hossain of BRAC University, Md Tajim Rahman of BUET, DM Junaid Kamal Nibir of DU, Abul Mohaimen Patwary of Uttara University and Shahnewaz Ahmed of BUET. The winners were awarded with certificate, a memento and cash Tk 10,000 each by the AF Mujibur Rahman Foundation while Bangladesh Mathematical Society awarded cash Tk 5000 to the 1st, 2nd and 3rd position winners in the contest. Prof Dr Abu Hasan Bhuiyan, dean, Faculty of Engineering, BUET, attended the award giving ceremony as the chief guest while Prof Dr Munibur Rahman Chowdhury, convener, NUMOC, Prof Dr M Anwar Hossain, UGC Professor and co-convener, NUMOC, Prof Dr Amulya Chandra Mandal, vice-president, Mathematical Society, Prof Dr Md Shahidul Islam, secretary, Mathematical Society, Prof Dr Manirul Alam Sarker, member secretary, 8th NUMOC Final Round- 2016, also spoke on the occasion among others. The competition began at different universities of the country on November 12 and a total of 62 students were qualified to participate in the final round. A written examination of the 62 contestants was held at 10:30am and a jury board finally selected 10 contestants of them as winners. Addressing in the ceremony, the speakers opined that the mathematic Olympiad mainly aims at improving standard of mathematics. The main objective of education is humanity and those who practices Math they become much developed in terms of humanity, they said. “There have a huge number of talents in our country but we need to take care of them. Education began in this part of the world 100 years before than that of the western world,” added the speakers. They also hoped that passing the limit of the country, the mathematicians of Bangladesh will take part in the competitions worldwide and certainly they will be able to show their capability in the world arena.